This Saturday (today!) 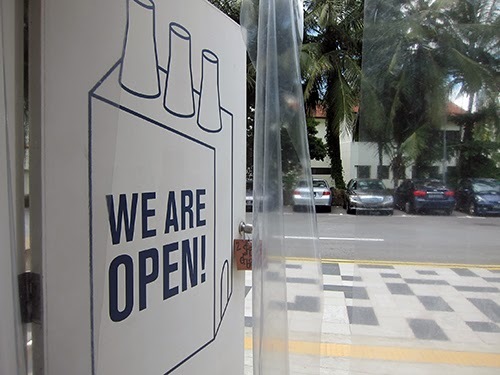 and Sunday are the last days to try out U Factory's pop up food concepts at Gillman Barracks. 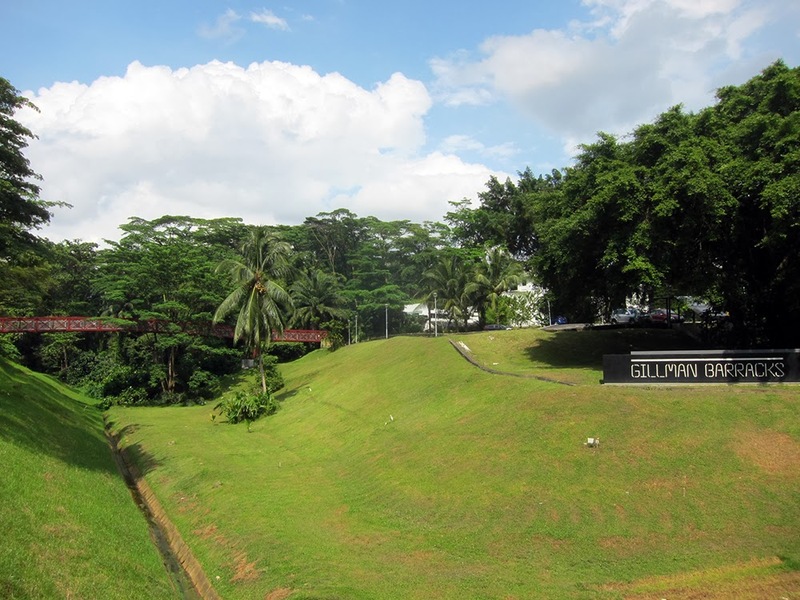 Gillman Barracks, one of Singapore's latest destinations for contemporary art. Pickled lotus root, pork confit, egg with shrimp paste and a "secret chilli", and salmon otak otak gratin. The dish should be eaten immediately says the chef, "Stop with the photos! Hurry and eat!" After my meal, he notes that I hadn't finished my egg. Whoops. It was difficult, but I resisting eating everything in order to make space for the other pop-up concepts. It seems Jeremy had noticed. "I remember every plate," the nazi chef remarks. 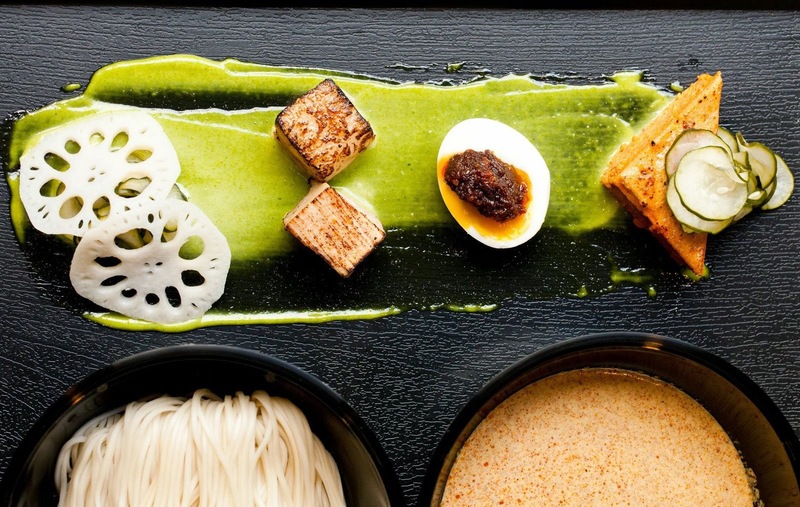 The set consists of wheat noodles that are lightly coated with chili, garlic, and ginger to prevent stickiness, and a rich laksa cream dipping sauce eaten tsukemen style. I'm also particularly taken by the shrimp paste over the half boiled egg and the salmon otak otak gratin. The salmon otak otak doesn't use flour and instead uses more egg and is then baked, resulting in a fluffier texture with more delicate flavors. I'm clearly not an otak otak purist. For closing weekend, Jeremy is preparing 100 bowls of Rakusabā instead of his usual 20. So nice ah. 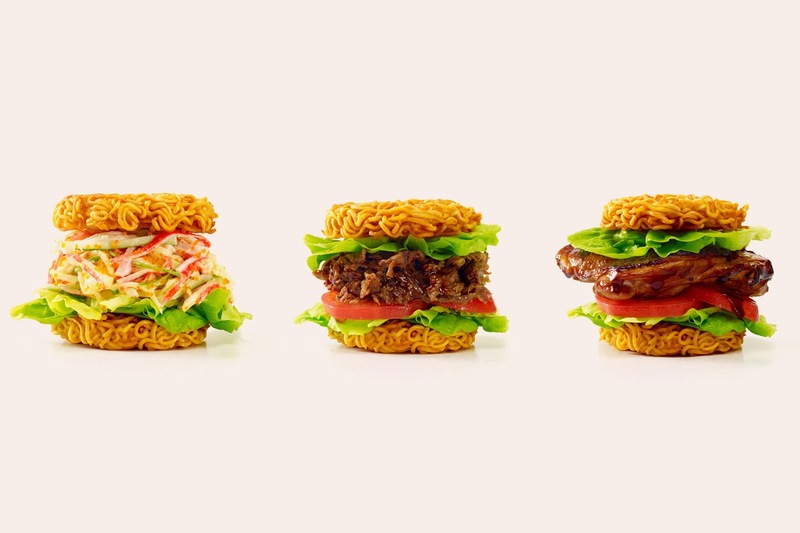 The ramen burgers are large and in charge. It becomes a messy affair once you dig in. 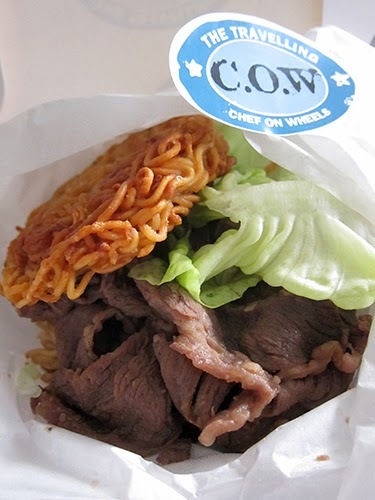 The C.O.W. 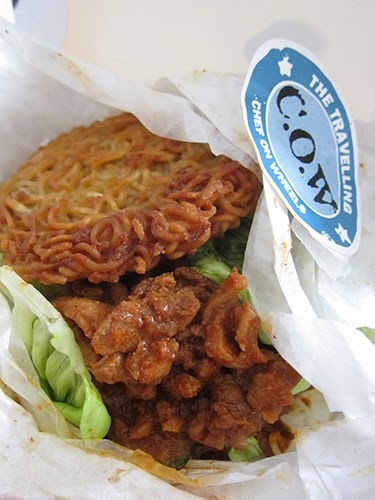 brings popular American concept, the Ramen Burger to Singapore shores. 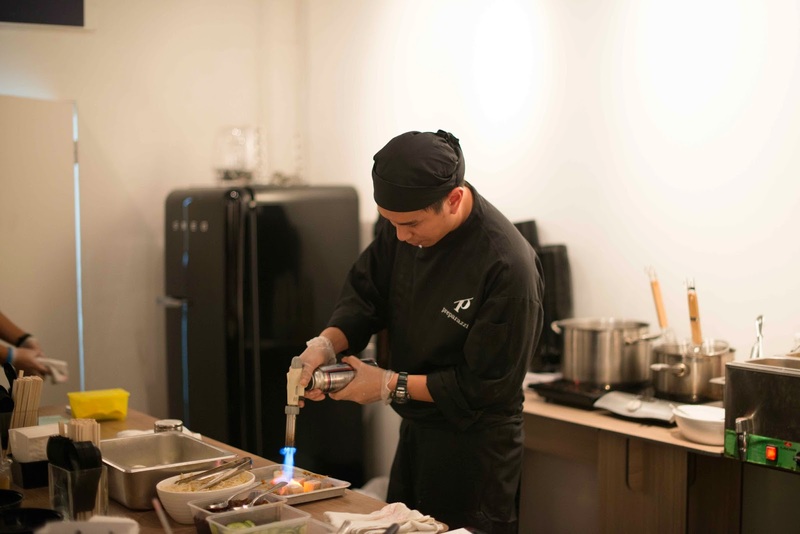 Honing the recipe to suit Asian palates (including her own), Karen and the chef use ingredients such as their signature Korean bulgolgi in lieu of a traditional beef patty. At $9 a burger, I'd say that's a pretty darn good deal in these parts. Maison Ikkoku is the only concept of the three pop-ups that currently has a permanent restaurant space set up on the island (though The Travelling C.O.W. and Preparazzi do have plans to set up shop later this year too). 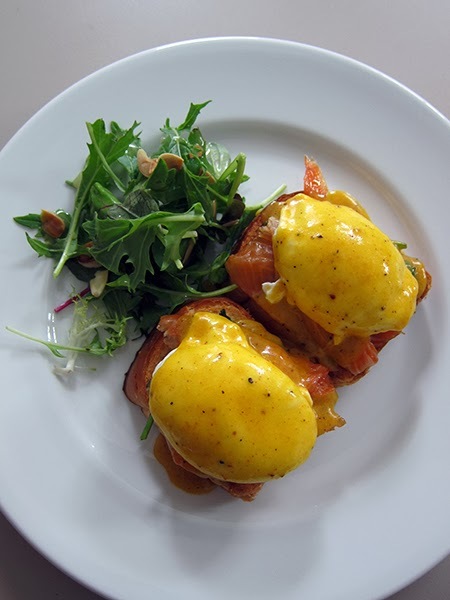 Maison Ikkoku has a special focus on coffee, which they offer at UFactory, along with desserts, a wibby-wobbly eggs benedict, and french toast with sea salt caramel. After you're finished noshing, you have the option to mosey on next door to the marketplace or UCafe where you can buy cool vintage glasses by Optics Premier or flip through non mainstream magazines that are otherwise somewhat hard to find your typical cafe in Asia (more information here). There was never a Soup Nazi in Friends. I think you meant Seinfeld.